Whenever shopping for hats and other outdoor clothing products, I've always steered clear of products with a UPF (Ultraviolet Protection Factor) rating because I've been concerned that the UV-protection might be through the application of chemical sunscreens. Chemicals sunscreens such as oxybenzones are often endocrine disruptors and other undesirables. This year, however, I needed to purchase a swim suit for my 4-year-old daughter. And it is difficult if not impossible to find a swim suit or swim shirt for children these days that does not advertise a UPF rating. In the past my kids have mostly worn hand-me-down swimsuits and swim shirts. I'm also willing to use second-hand swim shirts purchased at thrift stores. Although I vaguely understood that these hand-me-down and second-hand items most likely were UV-protective I didn't worry too much about it. 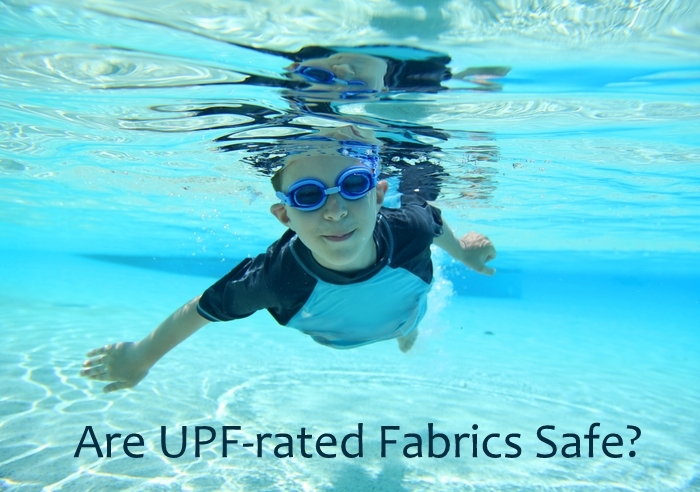 Now, shopping for swim clothes online, I was confronted again and again with products advertising their UPF rating, so I decided to do some research into how clothing is made UV protective before making a purchase. What Makes Fabrics UV Protective? Some of these (but not all) are coated or embedded with sunscreens. Some use synthetic chemicals such as benzophenone, which is classified as toxic by the Environmental Working Group. Others are “embedded” with the natural minerals zinc oxide and titanium dioxide. Not so natural, though, is the reduction of these minerals to controversial nanoparticles, which you probably really don't want floating around in your body. (source). Pennybacker also notes that while these chemical sunscreens most likely do not rub off readily onto skin, as the fabric ages the coating could more readily wear off, releasing their chemicals into ecosystems and onto sensitive skin. Luckily, chemical treatments are not the only way to create UPF fabrics. Fabric can be UV protective simply by the nature of the weave. The following brands, according to their product pages and websites, contain no chemical treatments and achieve UV protection solely through the weave of the fabric. One huge benefit of this type of swimwear is that the sun protection never washes out, as happens with chemically treated swimwear. Read on for additional details about how I discovered and researched these brands. I called Sunbuster's parent company Tuga and talked to a real live person who confirmed that the Sunbusters fabrics have no chemical treatment and are UPF solely based on the weave of the fabric. (At the time I was originally researching swimwear, this information was not available on the website.) The Tuga website now clearly states that "we use fabrics that are made specifically, both through the knitting and dying process, to meet the 50+ UPF standards of blocking 97.5% of UV rays (both UVA and UVB) while still being chemical free and great for sensitive skin. Tuga is always made from chemical-free, comfortable, lightweight, and quick-drying fabrics." UV Skinz (swimwear and hats for kids and adults), Bummis (hats, swim diapers, and swim shirts for 0 to 24 months), Baby Banz (swimwear, hats, and sunglasses for infants and kids up to 6 years old), and GruvyWear (swimwear for kids and adults) are additional brands I discovered while searching for "chemical-free" swim clothing on Amazon. The UV Skinz website explains that their "unique micro fiber blend" is "quick drying, silky smooth, chemical-free." (Bonus: I've snagged great deals on UV Skinz swimsuits at Costco the last couple of years.) The Bummis website states that their swim clothing is made of "specially woven fabric offers natural protection - no chemicals." The Baby Banz website explains that "Baby Banz swimwear is CHEMICAL FREE! The UPF factor comes from the tightness of the weave of the materials we use. The UPF will never wash or wear out!" And the GrUVywear website states that "our fabric is not embedded with sunscreen or toxic chemicals and the high UPF rating is solely based on the tightness of the weave of our fabric." Two additional options for UV-protective swimwear options that are free of chemical applications include Tumblegum and Sun Protection Zone. Tumblegum (swimwear and hats for infants and kids up to size 7) advertises its swimwear as "Irritation free, chemical free UV protection." The website further states that "the secret to the effectiveness of sun protective fabrics is foremost in its weave - the closer the weave, the better the protection. Superior stretch recovery helps maintain the closeness of weave and our fabrics breath ability enhances comfort both in and out of the water." Sun Protection Zone (swimwear and hats for kids and adults) states on their website that "The loft of the yarn, weight per square meter and tightness of the weave all contribute to the high SPF rating... Some companies use chemicals to boost the UPF rating which diminish over time. As long as SPZ clothing is cared for properly, the protection will last for the life of the garment." After doing this research on UV-protective swimwear, I decided to buy new swim suits and swim shirts for all three of my children and retire the hand-me-downs we've been using. I spent well over $100, but considering the amount I spend on a tube of natural non-toxic sunscreen , I figure I should fork over the money for well-made chemical-free swim wear. In addition, my kids' new Sunbusters swim suits and shirts are very cute and comfortable. My 4-year-old now wants to wear her swim shirt and shorts around the house all the time. Of course, even with UPF 50 swimwear, you still need some sunscreen, especially for long outdoor adventures like the beach. Make sure your sunscreen does more good than harm by consulting a sunscreen guide, such as the annual guides published by Environmental Working Group and Safe Mama. Natural non-nano sunscreens once left a ghostly film behind on faces and limbs, but in recent years they've come a long way and now go on sheer once rubbed in. The Goddess Garden* sunscreen spray is the only natural sunscreen spray I know of, and the only spray sunscreen I will use (which I use only on limbs -- never faces -- and with proper precautions to prevent inhalation). I also love the Badger sunscreen stick for its quick and easy application to faces, which is essential when pulling kids out of the pool or ocean for a reapplication! For swim lessons at an outdoor pool last year, I used Badger sunscreen sticks to quickly rub sunscreen on noses, cheeks, foreheads, and chins and never had a burnt face. It goes on pretty thick, though, and definitely leaves a thin white film on skin. With long-sleeve and high-necked swim shirts (the only kind I buy now), I only need to apply sunscreen to my kids' faces when they are swimming in the pool all day. *Note: I have written sponsored posts for Goddess Garden but now purchase their sunscreen with my own money and continue to use them because I have found them to be safe and effective. What are your favorite brands of non-toxic swimwear and sunscreen? Are all "SPF rated" clothing items chemically treated? I always thought it was honestly sort of ridiculous; isn't the basic idea of, you know, WEARING CLOTH OVER YOUR SKIN to protect you from the sun something our ancient ancestors have known for a millon years or so? Isn't that where, like, tan lines come in? This I find a little freaky. Thanks for the post--I didn't even realize I needed to look into this more! Nope, some UPF clothes are UPF just based on the nature of the fabric. All clothing provides some protection, of course. And then some fabrics are manufactured a specific way (without chemicals) to provide greater UPF protection. Any dark fabric (which absorb light) and tighter weaves provides higher protection. Holding up your fabric to the light/ sun and seeing how transparent it is gives you a good idea. Apparently a fair amount of sun can pass through a light-colored T-shirt, for example, esp. if it's wet. I think regular clothes are usually sufficient for most of us for most activities. If you were going to be in the sun for 8 hours a day 5 days in a row you'd probably want something better. I would be happy to buy a swim suit and swim shirt that was a quick-drying fabric without any UPF rating, but those options don't even seem to be out there anymore. Oops... I've always preferred Bummis and now I can feel,good about it too. We've never needed this sort of swim clothing, but thanks for your research on where to go if the need arises!